I have used both items in completely different contexts - cracked wheat in salad and wheatgerm in muesli - but would like to know what the difference is between them so that I can incorporate them into my cooking appropriately. Cracked wheat is a whole wheat berry that has been crushed or cut into smaller pieces. Wheat germ is a very small part (1.5 to 2.5%) of a whole wheat berry. It is rich in protein and dense with nutrients. It's hard to overstate how much wheat germ is a nutrition powerhouse. 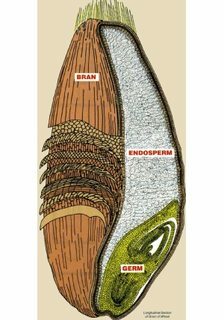 It has more protein than most meats (28%), contains more potassium and iron than any other food, and also is packed with riboflavin, calcium, zinc, magnesium, as well as vitamins A, B1, B3, and E.
The endosperm is what's milled into white flour; the germ is removed from white flour because it contains fat which can go rancid, spoiling the flour and shortening the shelf life. Cracked wheat, as it still contain the bran still has a healthy amount of fiber to it, and although I like it in baked goods, I'm more likely to keep bulgar wheat around (which is toasted and parcooked cracked wheat), as I prefer the nuttier flavor and shorter cooking times. Not the answer you're looking for? Browse other questions tagged wheat grains or ask your own question. What is the basic technique for cooking amaranth?